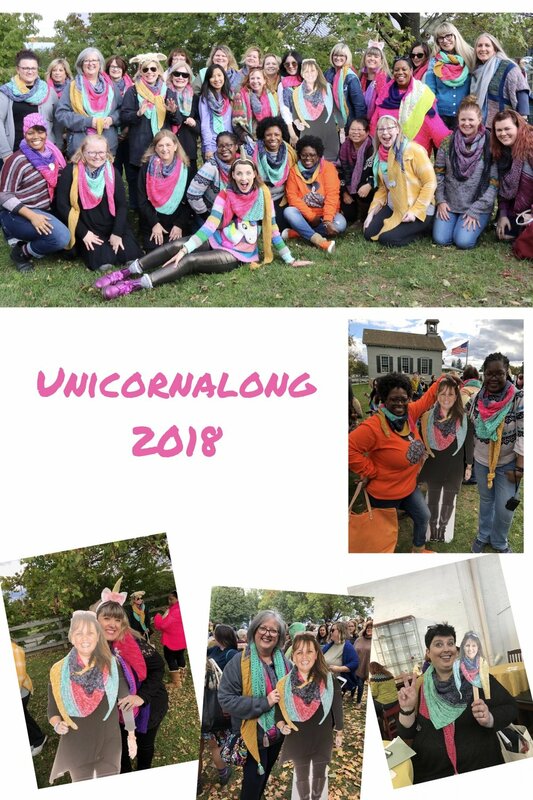 While I was so sad I had to miss Rhinebeck 2018 (New York Sheep & Wool Festival), I am NOT sad about this post: I present to you THE UNICORNALONG Group Photo! In fact… it makes me DOWNRIGHT HAPPY! The Shimmer & Whimsy CAL/KAL was magical. Being part of a collaboration with Stephanie of Asylum Fibers & Kristy Glass was filled with all the magic of a Unicorn to be sure. The whole project came together seamlessly and I just loved collaborating with these two gals. We each brought our own ideas and style to the table and I am thrilled with the end result. The kits SOLD OUT! So many of you joined us - even fellow knitters and crocheters who could not be at Rhinebeck. It was so special. So while I could not be there, Flat Michele had a blast meeting those of you who attended the group photo and I have loved connecting with each of you online.